Music & Books, Stories, Welcome to our home! 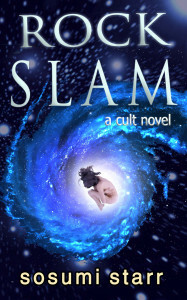 Rock Slam by Sosumi Starr, is a psychological thriller so deeply authentic it could only have been written by someone who has lived it. This novel is creepy and enlightening, monstrous and graceful. It is heartbreaking, heroic, and hopeful. It is a story of great losses and the battle to be fully human. The “brainwashing” process described by the author quietly crawls into your consciousness until the gross inhumanity of the cult bursts into awareness. Compared to water-boarding prisoners of war, this modern cult’s indoctrination is more cleverly deceitful and overtly immoral. Ms. Starr’s prose transitions from creative and poetic, to engagingly informative, and back again. The narrative is a wonderment of mazes. I’ve learned that evil will seep through society like a biological stew, the author tells us. Accept her outstretched hand. Walk with Ms. Starr on the thin ice between sanity and madness. You will be a wiser person for having taken the risk. Jeffery Kirkendall, Trauma Counselor, PTSD Caregiver, & Educator (34 yrs.) Co-author of Without Consent: How to Overcome Childhood Sexual Abuse and author of Indians & Aliens and unexpected short stories. * Sosumi Starr resides in Pagosa Springs, Colorado where she steers clear of cults.